Shropshire Door Canopies have been producing both oak and redwood porches for the past 10 years. Customers often ask the difference between the two timbers. 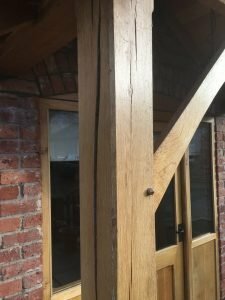 Oak has been traditionally used for the porches, but over the last 10 years we have experienced a number of problems with it, particularly on modern houses. The most common problem is that oak will move and “shake” as it dries. Even if the oak is air dried, it will invariably move when in situ. 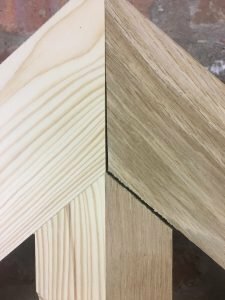 This means that the joints will open up and cracks can appear in the posts making it unsuitable for painting, and on a modern house this can look unsightly. The redwood has remained stable and the oak has shrunk, opening the joint. Our solution is to use a kiln dried redwood. This does not move or twist like oak as it is far more stable. 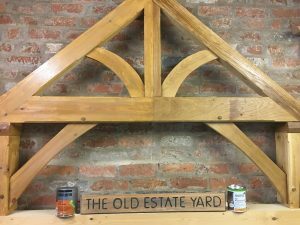 It can be painted any colour or stained to look like oak. 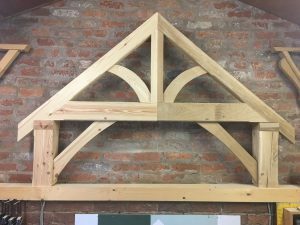 The ‘Grosvenor’ truss made from redwood on the left and oak on right. The same truss. The redwood coated with Sikkens ‘light oak’ and the oak with Osmo oil. As the above images show, once stained it can look very similar to oak and will remain the same way for many years. Redwood is also less than 50% of the cost of oak and far more sustainable as a timber resource, saving money and the planet. 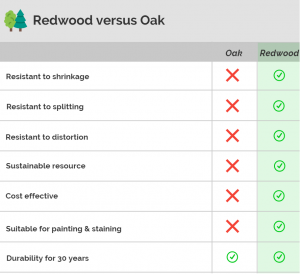 The only benefit of oak over redwood is the lifespan. Oak will last for 300 years plus, whereas the redwood will last around 30 years.